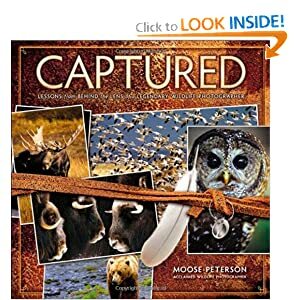 I recently started reading Moose Peterson’s book, “Captured” and am really enjoying it. Moose invites you into the interesting back story as to how he got his start as one of the leading wildlife photographers, shares some very useful advice on gear and photography technique and, of course, shares some of his favorite photos from his incredible career. Definitely worth picking yourself up a copy. This is the 3rd book I’ve committed to reading in an electronic format. For me the jury is still out primarily because of the device I’m using (an older Android tablet with not so great resolution). While I am in love with the idea of portability (Carry your whole library in your pocket? Who wouldn’t love the idea? ), there are still those times when I’m just not sure. I’m holding out for the release of the Windows 8 tablets later this fall (I’ve gotten my fair share of the iPad through my wife’s adventures) and hope that a better screen and form factor help bridge the gap. How about you? Do you have both feet in the digital content camp or are you still looking for bookshelf space for your hardcovers and paperbacks?